What is the most exciting activity you would do on a date? 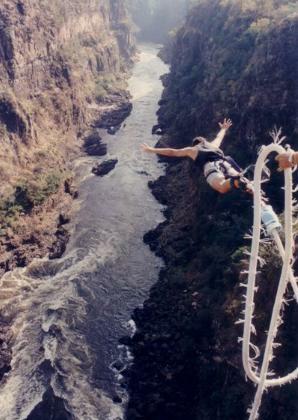 Bungee jumping looks fun. Depends on the risk factor and how far into dating we were. I like excitement like this but when I get excited I kind of cling on and get touchy (nonsexual) and I'm not doing that with someone I'm not comfortable with. Zipline or parachuting! Don't think I would do bungee jumping. But not sure until I try. Is it bad to date someone who is below your standards? Is "playing hard to get" a good thing? What's your "type" when it comes to dating? If you had to describe yourself to a potential date, what's the first thing that comes to mind in terms of "type"? Would you date someone who doesn’t eat healthy and doesn’t do anything to keep fit? Sailing or hiking in the mountains. The most exciting date I have done and would again was skydiving. I can’t think of anything much more exciting than that. Have to play it safe now. I once did a bungee jump ona date with my now husband. Was when we first started going out. Knock boots... 'cause anything else will have me cleaning up their tossed cookies for days. Not going through that again. Probably waking up and then going skydiving would be spontaneous and exciting enough. I'd have expected something more adventurous than that from you. Home > Dating > What is the most exciting activity you would do on a date?